Mugs’ deep history with yoga and her knowledge of philosophy and sharing of spiritual stories was so touching. Her book Letters from the Yoga Masters was so useful. I had no idea what I was in for til the books came in the mail…the spiritual aspect turned out to be exactly what I needed. They gave an abundance of knowledge about yoga philosophy, asanas, lesson planning, Sanskrit, kriyas, mantras and meditation. But to me the best advantage of my studies was that I gained deep faith in myself. It is rare for me to be this certain of a 10/10 for anything but I absolutely feel I have been taught the skills needed to begin to teach yoga. Everything in the program has a perfect process, everything was perfectly planned. I am so happy right now! I didn’t really know what to expect and I got more than I could ever imagine. I can’t believe how far we have all come in this immersion program. It has truly been one of the best experiences of my life and it has made me a better and happier person moving forward. I really appreciated the structure and scaffolding that it provided. The design is brilliant. You had us face our fears from day 1 by teaching one-on-one until ready to teach to larger groups. The support and guidance you provided was amazing. SOYA’s 200 hour Yoga Teacher Training Program. 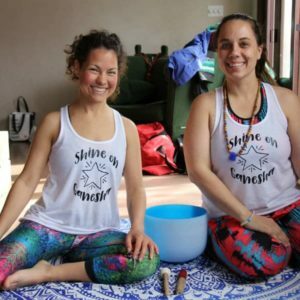 We offer 2 ways to complete the 200 hour yoga teacher training program: The 16 day Immersion or the Extended format with bi-monthly meetings over 4 months. 1) 15 written assignments in philosophy, including the Yoga Sutras, Bhagavad Gita, Kriyas, Chakras, Meditation, Pranayama, Professionalism, and Anatomy of Movement. These studies will reveal many yogic truths that will enhance your understanding of yoga and give you depth as a teacher! Register as early as possible prior to the immersion to give yourself time to complete these. 3) Keep practicing regularly in your local yoga classes or workshops! Spend time completely immersed in traditional yoga lifestyle, living your yoga fully every day for 16 days. Take this opportunity to become firmly grounded in daily practice of kriya, asana, pranayama, mantra and meditation. You will experience multiple asana styles and daily practicums to develop confidence and expertise in teaching skills, lesson plan design, and the ability to modify asanas for most people’s needs. Assignments completed at home are reviewed, discussed and put into practice. 7am morning kriyas, meditation, pranayama. Day 4 and day 9 will end at 1pm with the afternoons off. Take time to integrate the wisdom of yoga in our extended teacher training program. The program runs over a 4 month period with training meetings held two weekends each month. During the weekend trainings you will have daily practices in kriya, asana, pranayama, mantra and meditation. You will experience multiple asana styles and daily practicums to develop confidence and expertise in teaching skills, lesson plan design, and the ability to modify asanas for most people’s needs. Assignments completed at home are reviewed, discussed and put into practice. 7:30am morning kriyas, meditation, pranayama. Your 200 hour immersion Yoga Teaching program options. Your extended 200 hour teacher training program options. Sept – Dec in Vancouver-area (Pitt Meadows) BC.